Are you looking to buy a property in Albir? Below we have a guide and listing of the best estate agents in Albir (known in Spanish as inmobiliaria). This small but pretty beach resort is situated on the Northern Costa Blanca between the better known towns of Altea and Benidorm. 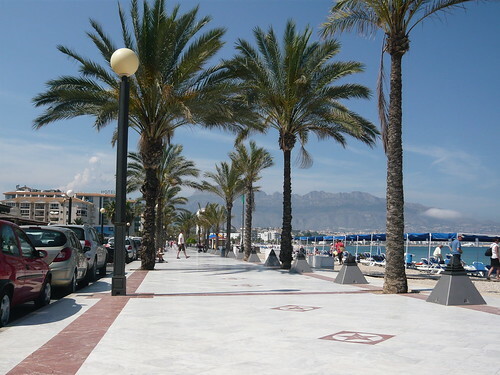 Albir is also referred to as El Albir or L’Albir and joins into Alfaz del Pi which is just slightly inland on the other side of the N-322 which divides the two areas. Costa Blanca Properties is a dedicated team of trustworthy professionals that will strive towards finding your desired home. We offer help and support to new expats and holiday home owners with the sale, purchase or rental of their property or commercial, we also have plots for sale too. If you want to know all about what it is like living in Albir and the current property market, then you must read our in-depth interview with Nigel Hellicar of Costa Blanca Properties, Villas-Albir on our main Albir page. After the crisis (if it’s finished), the property market started to improve slightly (0.4 percent) compared with the previous year. Now with Brexit it is difficult to say. It will depend on the strength/weakness of sterling against the euro and the terms that are negotiated for expats living in Spain and how the impact of the UK leaving the European market will affect the spending power of other Europeans. Banks still have a lot of stock, Brexit is a double edged sword. Current property owners who want to return to the UK are benefitting from the weakness of sterling and therefore able to reduce the price of their property. Still some good bargains to be had! Welcome to SOLALBIR, Real Estate Agents in Albir on the Costa Blanca north, with a wide range of properties, both for sale and long term rental. Whatever you are looking for – we will be able to help you find the perfect property to match your requirements and budget. Not only that, but we will ensure that we take away the stress of buying a property in Spain, by guiding you through the purchase step by step. Address: Camino Viejo de Altea, 36 Local 7 · 03581, Albir · ALICANTE. Address: Avenida del Albir no. 6, Local 28, 03581 Albir/Alicante. Main Office Address: C/ Oscar Espla. esq. Pau Casals, local 10, Edif. Mistral, 03581, El Albir (Alfaz del Pi) Alicante. Address: C/ Manuel de Falla, 2, loc. 5 – Playa del Albir – 03581 – L’Alfàs del Pi – COSTA BLANCA – Alicante – España. Address: Edif. Rocamar, Local 6, Avd. del Albir, 03581 El Albir, España. Address: Calle Pau Casals, 6, Edif. Los Ángeles I, 03581 – Alfaz del Pí (Playa del Albri), Alicante – España. Albir Confort Properties offers a selection of properties for sale and long term rental, offering professional management and rental sales, with the best warranty backed by the loyalty of our customers. • Marketing of new developments. • Management of property investments. • Holiday and corporate apartment rental.